Thinking of joining up as a group? An increasing number of groups have been joining Projects Abroad this summer. Whether you are a school group or a group of Girl Guides have a look at some of the options available to you. 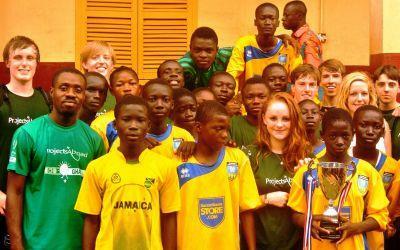 This summer there have been groups working on Care and Community projects in Ghana. There have also been groups doing a combination of Care and Conservation programmes in Costa Rica; and we have had groups of students joining Medical programmes in India and Tanzania. ‘Two weeks can be viewed as a long time to spend away from home, but in Africa, it flew by way too quickly. I know none of us will ever forget our experience, the things we seen and the difference we made to people's lives,’ said Sarah Jones who recently did a Group Trip in Ghana. If you are joining as a group you need to give yourself plenty of time to get the money as well as the group together. Fundraising is a big part of the group experience. If you would like to read more about other’s experiences have a look at http://www.projects-abroad-groups.co.uk/group-experiences/case-studies/.